Our Fish Oil comes from non-threatened species of wild-caught, small, plankton-feeding fish (anchovies, mackerel and sardines) that are low on the food chain. Harvesting these types of fish also ensures that our oil tests below acceptable limits of harmful contaminants set by the Council for Responsible Nutrition and other advisory agencies. Spectrum uses only the purest fish oil with a naturally occurring ratio of 18:12 EPA to DHA. Convenient 1000 mg softgels. 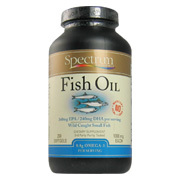 Fish Oil 1000 mg - is shipped in a discrete, unmarked package. Orders are processed immediately and usually take about 3 to 5 working days to be received. We do ask that you try it for 2 to 3 weeks to feel the full effects. Any information received is used only for order processing and shipping purposes. Your information, such as e-mail address, will never be disclosed to a third party.